This is the water heater that came with our house. 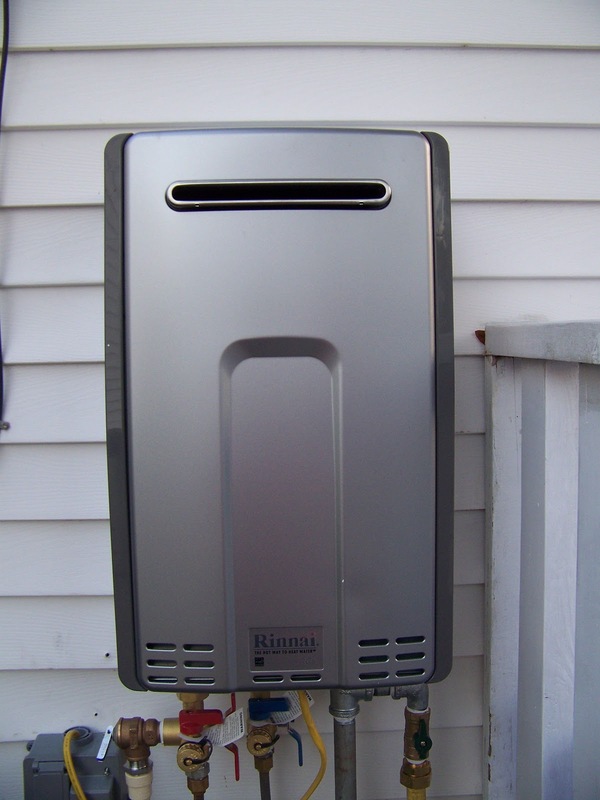 In FL, since you don't have to deal with freezing temperatures, you can theoretically put your water heater outside. 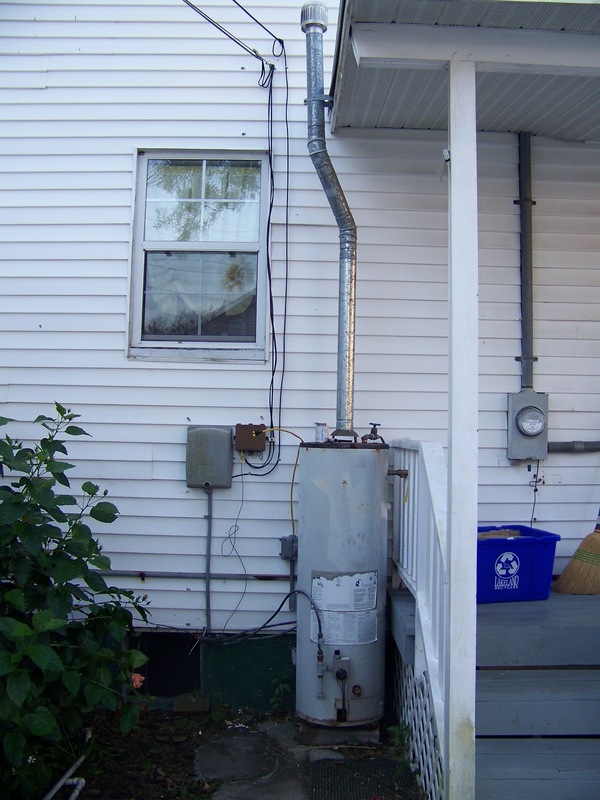 I say theoretically because you can do this no problem with a water heater that is designed to be outside or an indoor one with an enclosure. 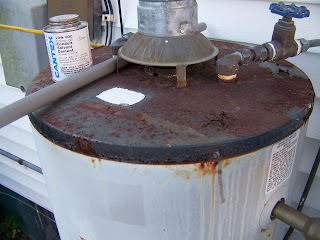 However, when you put an indoor water heater outside with no real enclosure, it doesn't work so well. In our case we had a rusted out water heater that had an uncanny knack of blowing out right when you were outside the shower waiting for it to get warm. We tried to get it replaced with the home warranty that the sellers provided with the house but since it was an indoor water heater outside the foundation of our house, they wouldn't replace it. So we have been living with this thing for over a year. Recently it had been blowing out more and more until we just couldn't take it anymore. Since we also wanted to move the gas line for our cooktop in the kitchen, we took the opportunity to have both jobs done at the same time (cheaper and less time consuming). 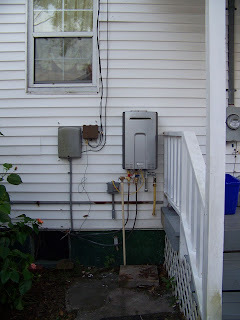 We replaced the water heater with an outdoor, gas, tankless water heater. Since it's tankless, it takes up a lot less space and is a lot more efficient. Plus, it is a whole lot easier to look at then our old eye sore. It took the plumber about 3 hours to install this guy and run the new gas line to the stove. I don't know if I would use this particular plumber again (they work with our gas company to install new water heaters) since he was an hour late and really had a thing against dogs (he even yelled at Zoe for sniffing his leg which I thought was really inappropriate) as well as not doing a couple of things exactly right but he did get it done and we have hot water whenever we want so overall the job was a success. Plus, with the cooktop gas line moved out of the way, we were able to really push ahead on the kitchen! And just so you can see a great reason why I'm so happy that this non-DIY project is done, here is the before and after. Oh yes...water heater woes! 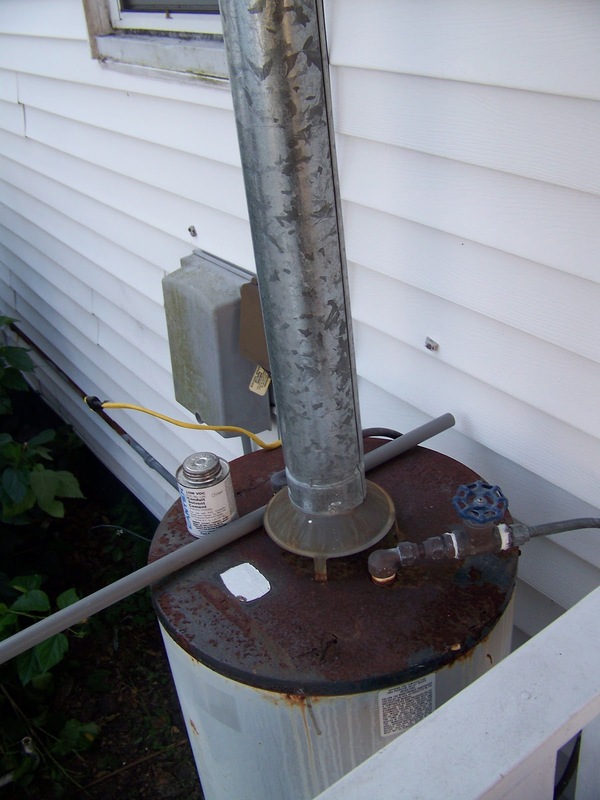 We are currently experiencing water heater woes. 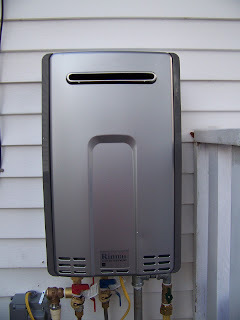 I'd love a tankless water heater. 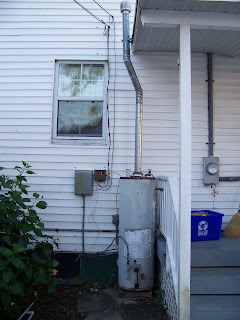 We us LP (liquid propane) the tanks are much more expensive than natural gas...why? I have not a clue. You'll have to let us know how this does on cost to run, hot water demand and supply, and overall enjoyment; after you've had it a while.